What’s next? 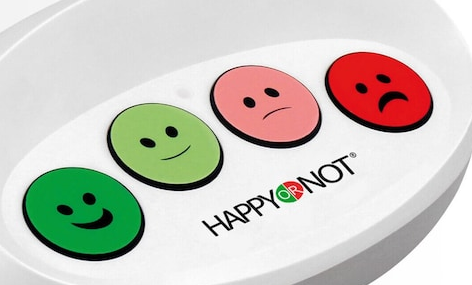 a row of smiley buttons to say how, overall, you rated your life just before you take your last breath on a hospital bed? I find this amusing as I recently took my first trip abroad to Europe from the USA. The emoji buttons in bathrooms is definitely something I noticed as something different. Where I’m from you may find a light switch with a note saying to switch it if bathroom needed attention, but the satisfactory survey using buttons isn’t an application. I’m curious to see the actual tends of people pushing their response to the survey and the action from the results. “Approaches like Watt’s and Beer’s, which keep a system operating within tight parameters, demonstrate negative feedback. That’s not pessimistic or bad feedback, but feedback that prompts the system to maintain control. In traditional, cybernetic terms, negative feedback isn’t a one-star rating, but any information that helps the system regulate itself. Negative feedback is actually good feedback because it yields greater efficiency and performance, as in Watt’s steam governor. Positive feedback, by contrast, causes the system to keep going, unchecked. Like a thermostat that registers the room as too warm and cranks up the furnace, it’s generally meant to be avoided. Online rating systems don’t give feedback that can be used to help regulate the systems anymore. Brilliant. So a post about people getting tired of giving feedback gets feedback. BTW, Tripadvisor is another. I’m fed up of doing their work for them. And what if this turns into a thing. Tripadvisor without reviews ceases to exist right? Thank you for the article. I suppose I didn’t even notice the buttons at other location other than the bathrooms. It is good to know that a threshold of unhappy responses prompts an alert. As a traveler through Exeter Airport I could see why it was the a happiest as well, however I will forever love the massage chairs at AMS. Reviews I believer can be incredibly helpful, but like Kevin’s article pointed out, they can make or break a small business. I typically only write reviews if I’m incredibly impressed or dissatisfied with a business or product. I’d be curious to see what % of all consumers and customers actually participate in the review process on average and what the effect is on the business profits or product sales.